Last night I had another meeting with my Women Circle, and we continued the topic of the First Clan Mother - "Talks With Relations". We had two very nice exercises, one of which was to say out loud "I am a master of..." but it had to be something positive. And it wasn't easy at all! "I am a master of not finishing what I started." "I am a master of withdrawal." "I am a master of procrastination." And I saw that other girls also struggled with chasing away the first negative thoughts that came to their minds. Why is it so hard to think good things about ourselves? Isn't it enough that all the others are so very critical about us and we have to add this inner critic as well? Why are we afraid to find nice positive features in ourselves? Are we scared to be regarded as boastful? Why, even if we eventually say something nice about ourselves, we immediately counterweight it with some "but..." which scales down our achievements so they would seem small and insignificant? Who taught us so? Think about the answers to those questions as I will. 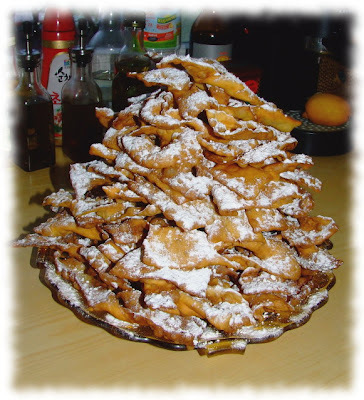 For all of you - a piece of Polish tradition: carnival cakes called faworki (one cake = faworek). You can find the description in my post from last year. You mean it doesn't count that I am the Master of disaster? *grins* We are our own wost critic. Mmmmm your faworki look so yummy!!!!! Yup, that negative inner voice seems to be something that most of us are born with (especially women!). I know it sounds weird, but I think that there does have to be a balance in our minds between loving ourselves and having some criticism as well. People that don't have that self-critical feature are sociopaths who have no respect for others! But you can't let the negative side take over either. It's a tough balancing act. Love the paper doll you did for Norahs party! gret journal pages adn you have some FANTASTIC stuff in your etsy shop. Will have to stop by again. Have a great weekend. yum..funnel cake (as I know it?) It is very hard..why IS it hard to boast about ourselves..I suppose the 'ego/ arrogance' factor- no one really wants that. I am the master of being realistic. (there! Truly, that was the first thing I thought right now) Thanks for the prompt! I love evertyhing about your blog you know..the journal pages, your writing etc, but most of all I love your faworki..hey dont you call them chrusty? does anyone actually call them that anymore? It would help my P. lang if you could tell me I am always trying to improve it.